Filmmaker Judy K Suh is the writer and director of the short film Roberta's Living Room. The film has already been shot and is now in the process of being edited. We interviewed Judy and learned more about her background as a filmmaker. Read on to learn more about how the film was conceived and view behind-the-scenes photographs shot on set! Tell us about the film you are working on! How did you conceive the idea and storyline behind it? 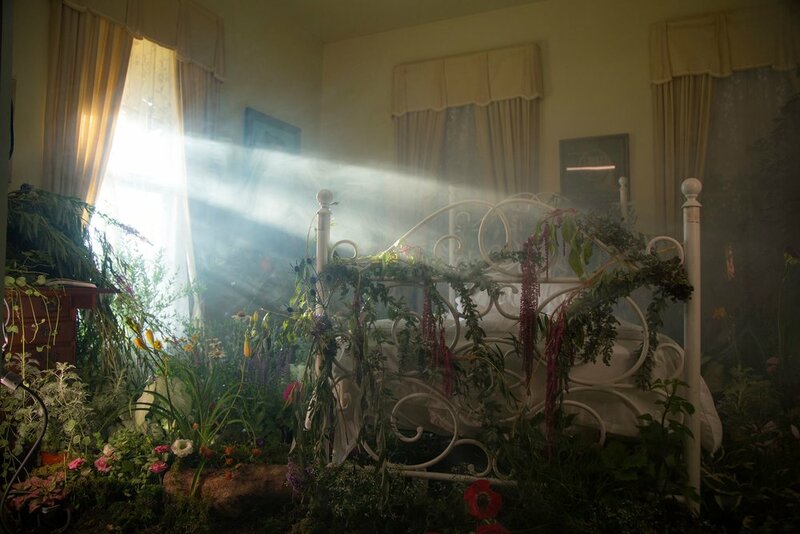 Roberta’s Living Room is an enchanting, Magical Realist tale of a woman planting a garden in her living room in pursuit of the most ideal death. However, in that process, she awakens to a certain beauty in life. At the heart of it, the question was always this irony that every single human dies, yet nobody seems prepared for it. But it's not a morbid film — it's full of gypsy musicians, lively plants, and comedic moments at times. Ultimately, there's a big celebration that is life-affirming. I think it works because the film falls under Magical Realism, a genre in which strange, fantastical things happen in a matter-of-fact manner and everyday setting. I came up with the story about 5 years ago. I saw a photograph by Gregory Crewdson that really struck me, and imagined what happened to the woman in it. Later, on a separate occasion, I learned that plants breathe in oxygen at night. So if you're in a closed room with many plants, they can take away your oxygen...and you could, perhaps, die. I'm sure that's a huge exaggeration, but I thought that was so ironic and intriguing since we usually associate plants with life. Then I had this image of someone dying in a garden-filled room and that seemed like such a peaceful, beautiful ending to life. I combined these ideas and wrote a story. The essence of the story was always there from the beginning, but many details and meanings changed countless times over the long period that I wrote it. I can't even remember how many drafts I went through. How did you delve into the world of filmmaking? When did you start developing an interest in making films? Did you study film in college? I was a pre-teen when I started getting absorbed in the idea of filmmaking because I was watching behind-the-scenes and frequenting the local VHS rental store too much, haha. I was living in South Korea at the time, and my middle school offered an elective course on filmmaking which I opted for in a heartbeat. In that class, I made my first short film as a 13 year old, and then pretty much stuck with this path since. I also studied film in college at Northwestern University! A number of my current collaborators are friends from the RTVF (Radio, Television, and Film) program. Which aspect of filmmaking (such as directing, producing, or cinematography) are you most interested in? I'm most interested in directing. I like overseeing the whole process of the movie coming together on the creative side. But I don't love the logistical, administrative side of it, which is inevitably an enormous portion of the process. A good producer helps make that smooth though. I like editing too because that's when the film really starts becoming a film. And it's also the most immediately gratifying process because you see the progress before your eyes, unlike in the pre-production or production process. Given that you made your first film at 13, how have your ideas and filmmaking skills developed since then? I think the most important things that develop with time and age are ideas — they should also mature with the person. Now, I think more about what my film is saying and how to best tell that, as well as how much it reflects my own experiences or those around me. I look to a lot of references now, whether that's to help the story, character, the look or technique. I try to be aware of those references and find how to best utilize or avoid those. I am also getting pickier by the day. I pay a great deal of attention to the visual details, and make sure the visuals are all collectively speaking towards the same story. It's a challenge to orchestrate all the disparate aspects of filmmaking to come together as one, but when it works, it's very rewarding. What do you hope to accomplish with Roberta’s Living Room? My first and foremost goal is to just make the best short film that it can be, and tell the story that I envisioned telling. People ask whether this will become a feature film in the future, but honestly it was conceived as a short film and I think that's the best version of this story – at least the way it stands now. It would be fabulous if this takes me to some cool film festivals around the world. I hope this project gives me further opportunity to connect with more talented filmmakers and collaborators. I hope that through this film, other ideas will sprout from it – not just in terms of the next film, but also in other creative works that I do, like my projection-mapping installations. Have there been any struggles in making or funding Roberta’s Living Room? Absolutely! Just like any film, I suppose. Funding was and is the greatest struggle. It took me a long time to even figure out a budget, because the last time I did a narrative film that wasn't run-and-gun was in college. There, equipment and labor were free — the two most expensive things! It was a great big mystery when I was starting this project just where the money would come from. It's an ambitious project. Short films don't have a great platform and there is no profit model, which means that any money we raise has to be in the form of a generous giving or investment in talent rather than for a return of profit. So the only way to move forward without being indefinitely stalled was to finance it in stages. I was incredibly lucky that the first person who came onboard was an executive producer ready to invest in my story and talent. Spanish producer Ursula Romero and her company APNEA Films financed a good portion of the film. However, there is still quite a way to go and a crowdfunding campaign became inevitable. I don't love crowdfunding, but we had a good opportunity to make it an exciting one. We have a concept that is very attractive and also collaborators, such as former members of Beirut, to draw attention. We're running the campaign throughout production and post-production so that we can give our backers very concrete updates on our progress. We also got many artists and organizations to donate artwork and event tickets to give to our backers. Planning all of this while also making the film at the same time was probably the hardest thing. But the great thing is — the film is already shot and the footage is looking really gorgeous, so I feel more confident asking people to be a part of this. Speaking of, we are currently still running the crowdfunding campaign so please check it out! Any amount of contribution will help, and there are lots of exciting rewards to choose from. What is it like being a female director in the film industry? Are there any gender specific struggles? Frankly so far, I've not faced any gender specific struggles. Perhaps I'm not yet steeped deep enough within the film industry. Alternatively, I may not be perceiving it, because I tend to be kind of insensitive about things like that. I find the struggles so far to be the struggles of a filmmaker and an artist, not necessarily about being a woman director. Reversely, I have experienced some great upsides to being a woman director. This topic is kind of a hot topic right now, and there's a big movement around it. I see a lot of women filmmakers rallying for each other. For instance, there's an equipment rental house in Chicago called Camera Ambassador. The owner of it, Erica Duffy, found out about my project during pre-production and reached out to offer an awesome equipment deal because she wanted to support women filmmakers doing cool projects. I think it's a great time to be a woman filmmaker because we are supporting each other and there are so many stories about women from women's perspectives to be told. What film or short have you made that you’re the proudest of? Ah, that's a tough question. I feel I have a long way to go with narrative films, and Roberta's Living Room is probably going to be the one I'm most proud of so far, even though it's only at the start of post-production. I do various other types of video work other than narrative films, and one of my growing passions is in projection-mapping installations. It's a technique where you project video onto objects and different surfaces that are not just rectangular screen. I'm proud of a piece I did called To the Moon and Back. It's a 6-minute installation that has a similar kind of magical tone that I tried to imbue in Roberta's Living Room. I want to do more of these, but bring some narrative to it. What is your favorite movie and what do you like about it? I have a few favorites, but if I had to pick one, I'd say Eternal Sunshine of the Spotless Mind. There is something so raw and magical about that movie. I love how memory is materialized and visualized in the film and becomes something the characters can travel through. It's so silly but also so creative in the way this idea's expressed. I also appreciate the theatricality of certain moments; how the director Michel Gondry plays with locations and lighting and scale of objects to achieve practical effects, and not rely on VFX to create this strange world. Also, props to casting Jim Carrey and Kate Winslet in roles that are the most opposite of their public personas. The first seed of inspiration for my stories often come from an image and the background of that image. In the case of Roberta’s Living Room, it was a photograph by Gregory Crewdson, and some facts about plants that got me started on the story. Eventually, though, countless other things influenced it. Gabriel Garcia Marquez's books are very influential to me. He is the father of magical realism. His books have so many elements that get the imagination going. For my future projects, I want to look at Korean folklore for inspiration. I want to do more work that draws from my own cultural heritage. What are your plans for the foreseeable future? I will be focused on finishing Roberta's Living Room for the next couple months — and hopefully watch it go to film festivals! I will be developing new story ideas during that time. I also can't wait to get back to my projection-mapping work. I want to make pieces that derive from this film's motifs. I also want to collaborate with other artists. Last year, I was in a couple of artist residencies and they were amazing, so I plan to do more of those to develop new work. In the next few years, while continuing to work on my own projects, I want to also get experience on other directors' films to learn how others do it. Maybe I'll learn a few tricks that I would have otherwise learned the hard way. Re(de)fining Magazine is an online magazine dedicated to young women as they redefine and refine who they are. In a magazine industry that tells women they're not good enough, Re(de)fining Magazine is countering that by spreading a positive message. We highlight topics relevant to young women today, ranging from social issues to mental health to fashion. We celebrate creativity by sharing the artistic endeavors and entrepreneurial ventures women have made. We value honest stories and reflections that instill a sense of hope and challenge us to grow.